In what is expected to be a significant game-changer in the retirement industry, the Department of Labor (DOL) unveiled its fiduciary rule this week. Certain elements of the final rule, including the “Best Interest Contract Exemption,” were modified after last year’s public comment period elicited more than 3,000 submissions. In addition to scaling back reporting requirements for certain items, the DOL is proposing a phased implementation that gives the industry more time to fully comply with the rule. Still, the final version is being scrutinized by stakeholders for clarity on its impact on the retirement industry, and in particular, the individual retirement account (IRA) segment. IRAs represent about 30% of total retirement assets, and, in 2015, the Investment Company Institute estimated IRA assets totaled $7.3 trillion, surpassing the $6.8 trillion in defined contribution plans. The broader definition of fiduciary will take effect on April 10, 2017, and for advisors seeking a best interest contract exemption, there will be limited requirements. Additional requirements for the exemption will go into full effect January 1, 2018. The fiduciary rule marks the first major change to the basic rules governing retirement investment advice since 1975, the DOL noted. Critics argued that the rule is complex and creates cost and compliance burdens for the advisor, and ultimately would have the unintended consequence of limiting access to advice for many savers. 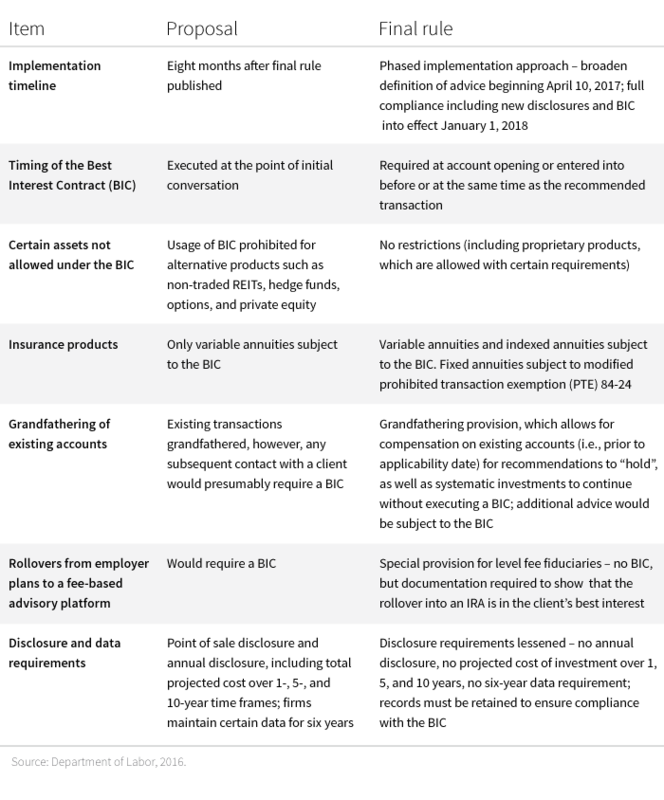 Advisors seeking more detail on the rule should explore the DOL’s overview site, which includes a fact sheet, and the full text of the rule. Since the proposal was introduced in April 2015, numerous bills were launched in both the House and Senate pushing for a congressional solution to the rulemaking.